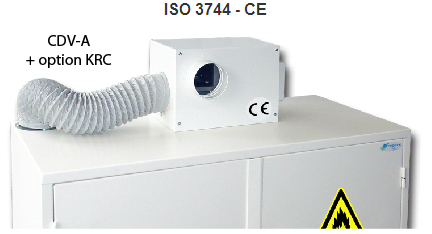 The electric fan allows the extraction of toxic vapours generated inside your safety cabinet. Fan in compliance with ISO 3744; 0 marking. Fan in compliance with ATEX on request. Please contact us. Adaptable to all of our cabinets. Easy connection between the cabinet and the vent box. Connection by flexible tube Ø 100mm (in option). Lighting control allowing to survey the proper working of the fan. Steel electric scroll engine installed on silentblocs: - 220/240 volts 50Hz – 55,5 dB(A) - Flow: 215m3/ hour- Protection IP44 - Exhaust inlet and outlet: Ø 100 mm . - Switch ON/OFF with lighting control. - Possibility of flow adjustment thanks to dimmer. 1 connection unit Ø 100mm(ref. CHJ) to be fixed on the cabinet air outlet. 1 metre of flexible tube Ø 100 mm (ref. KL100). 2 clamp collars Ø 100mm (ref. CDS100).